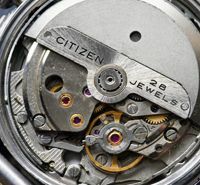 The 21 jewel 8200 automatic movement (21,600 bph) was first produced around 1975, and by the end of the 1970s it had become Citizen’s standard automatic, as the range of mechanical watches was massively reduced as a result of the quartz revolution. Although the majority of 8200’s you’ll see are 21 jewels, they were also made with 17 jewels – I don’t think that version was used in the Eagle 7 line though. Although I include the 8200 in the Movement Table, it was one of the latest movements to be produced in the time frame I have researched, and I don’t (as yet at least) have an example in my collection. However, it is an important movement since it became the Citizen’s base auto for many years, used in a great number of models up to the present day, especially the ‘Eagle 7’ line which rivalled the Seiko 5. These watches regularly show up for sale, and other than the diver models they don’t make a great deal of money. However, in good condition they should be reliable and accurate watches. 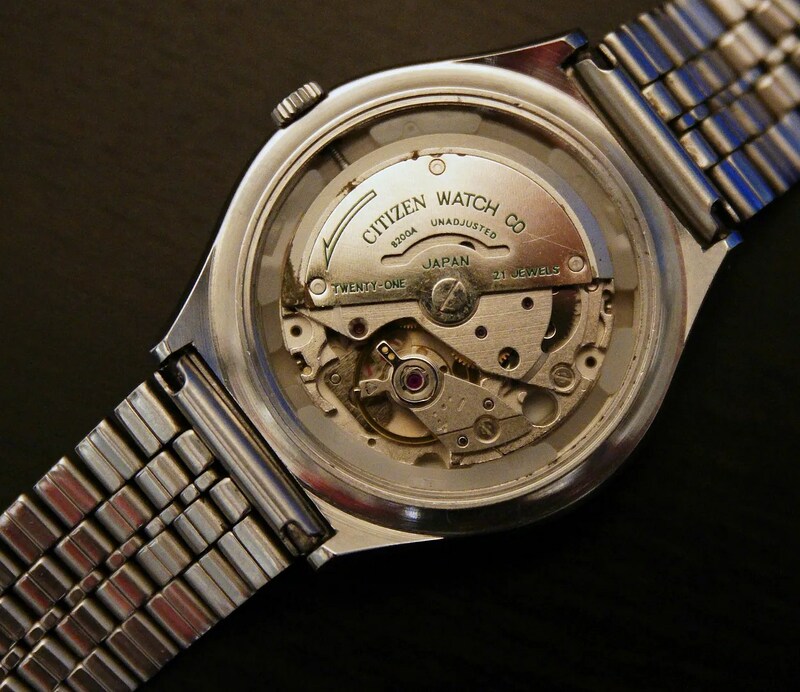 This entry was posted in Vintage Watches and tagged Citizen 8200, Vintage Citizen Watches. Bookmark the permalink. Sweephand, I am in a bit quandary. I have just acquired a pristine Citizen Automatic 8200A and I wanted to ask you if you think it is all original or whether it has been reconditioned. Citizen Watch Co 8200A Unadjusted Japan Twenty One 21 Jewels Along with 7 or ‘V’ at the 7 o clock position. 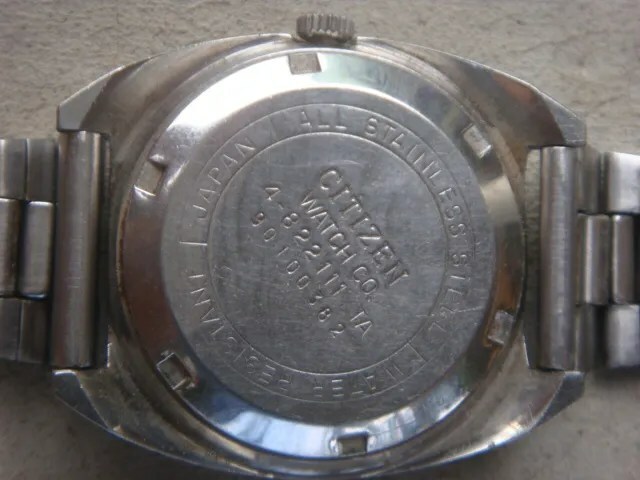 Since the dial has been re-done, or replaced, which suggests the original was not in good shape, it’s possible that the case has been re-plated. Sorry this is a negative assessment – I have seen lots of these sort of re-done watches on eBay, I would guess that you didn’t pay too much? Sellers should say what has been done – I know they often don’t of course – but at least a ‘junk’ watch has been saved from the bin. The worry is that the movement has seen much better days although yours looks clean and corrosion free. Thank you for your response, it was very much as I had expected it is also very nice to see what the watch should have looked like. I must admit that the colour of the face was the reason I bought the watch in the first place. May I also say how much I enjoy your blog and informative and passionate descriptions you provide about these wonderful watches; is there any chance for an article on the eagle 7 range in the future? thanks for your kind comments, they are much appreciated 🙂 The Eagle 7 range actually falls outside my core collecting area, since those models were made after 1980. As a result I have got little reference material, other than on the 8200 movement itself which was first made around 1975. I’ll certainly consider doing something on the movement, since that is clearly within my time period, and that would have to refer to the Eagle 7’s to be comprehensive. Just picking up on the above, I have seen lots of these watches on ebay/Etsy for example. I am finding it difficult to recognise original dials. The pics they provide of the movements look authentic but the dials are all sorts of different colours and designs. Some are outrageous! I know they only go for small money so not losing out much but it would be nice to be able to recognise new dials from old (any model not just the Eagle 7’s). have you any tips? Hi Chris, all good here thanks, hope the same goes for you. It can indeed be difficult to identify correct models / dials. Citizen produced some colourful dials and unusual designs themselves, so not all of the weirder ones are are necessarily re-dials/re-paints. However, there are many examples on eBay with re-painted dials – mostly these seem to have been done in India, where I guess people are rescuing watches where the original dials are in poor condition. And to be fair at least some sellers say that the dial is re-painted in the description. The cases and movements are probably original, although sometimes the cases are heavily polished. 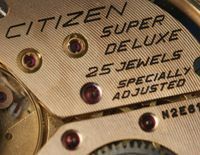 Citizen made a lot of the 8200 models, most commonly the ‘Eagle 7’ ones (but as you say not always) in the 1980s and 1990s. I don’t have original catalogs for the vast majority of these so it is a question of studying the dial and coming to a conclusion about it, using the case and model numbers to see if another example can be found. Some re-painted dials are obvious, since their quality is not good enough to be original, e.g. less than fine printing, crudely cut applied logos and sometimes odd emblems, whilst some have ‘Citizen’ applied in what looks rather like solder. These can be easily discounted as original, but others are less easy. First off I would advise doing a search for other examples, using the case and model numbers – if you can find others then they can at least be compared. When examining a dial, look for a dial code near the 6 o’clock marker – if that is missing then it’s likely to be a re-paint, or at least touched up round the edge. It may be difficult to see in a photo, so ask the seller to confirm whether a code is there. Usually, for an 8200 model, the dial code will start with ‘8200’ or be in the form of ‘6-82XXXX’. Also, compare the quality of the dial printing and logos / emblems with other ones which are known to be original – re-paints are likely to be coarser than original quality. After that, if you’re not sure about a piece, I am quite happy to take a look and see what I can find out / conclude about originality or otherwise. Thats great thanks. It is a bit of a mine field it seems!! Yes, the majority are from India as you said and some have an ‘Asian’ style look about them..Golden/colourful dials. These will brighten up my collection. Seems like I too got burned by the fancy dial…. Hi, am searching information about a Citizien that i found in my house, but i did not foun much information, I saw the numer 8200 (Japan 8200) and google showed me this link. The watch is old as the movement. The watch has the following numbers and codes. what information can you give me about the watch? 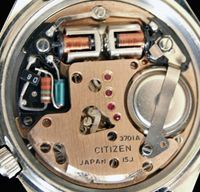 The information from the case back on your watch indicates it is one of the Eagle 7 models, which use the 8200 automatic movement. Although this movement was first produced in 1976, the Eagle 7 range appeared in the 1980s and was made right through the 1990s. From the style of the case back numbers I would say that the first three parts of the serial number on yours – 9056704 – give a production date of May 1989. The other numbers are the case number (4-062787) and the model number (71-1705). ‘GN-4-S’ is the case type code, indicating a water resistant crystal and screw-on back. Many thanks for informative blog. I just bought a Citizen 71-2639 with a 8200A movement. Information on the internet indicates it is a 7 Eagle but there is no such logo on the watch. Is it a re-paint? H Fredrik, thanks for visiting my blog. It is a repainted dial, usually the ones like this have been re-done in India. I guess that the original dial was badly worn / damaged so it’s a way of rescuing the case and movement. What’s happened to the second hand? it seems to have gone AWOL! Thanks for the reply. I will bring this up with the seller. I now have a small collection of vintage Citizens…4 in total but as I am very happy with the first three ones there will be more to come. Good luck with your discussion with the seller. Nice to hear that you have some other Citizens – which ones do you have? A Parawater 21j 63-4093 with a blue shimmering dial…from 1972…a Simpson? An Automatic 17j parawater 62-8018…1971 it seems. Black dial. A CCP 63-6517 with a silver bullseye dial. Can not figure out the year but around 1970. Will get back with pics. Hi, I own a Citizen automatic 21 Jewels. I bought it from one of those India shops on Ebay. It has a nice black face with gold index hour markers. It has served me well for the past year. Today, I dropped it on the wood floor and guess what, it stopped. Is it worth rescuing? 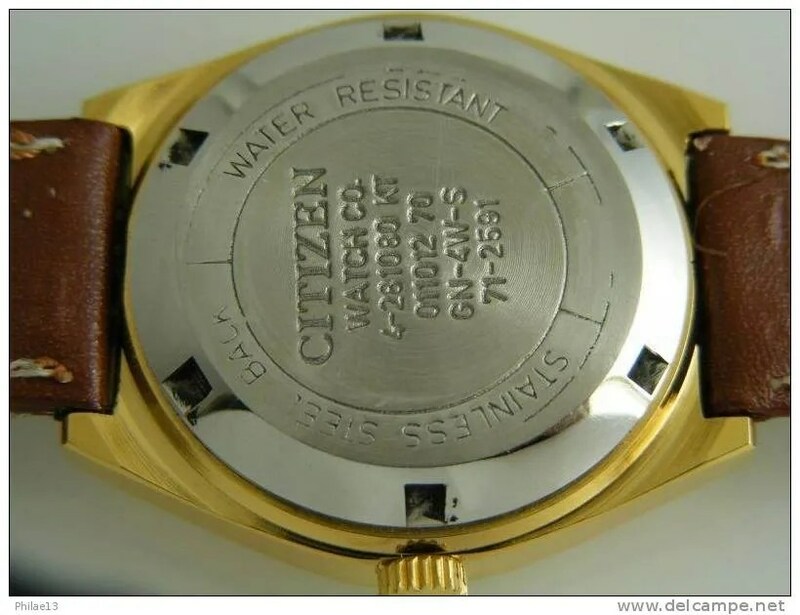 The back is labeled Citizen Watch Co. Water Resist Stainless 4-824083K Serial 30103042 GN-4-S Japan. I like the look and feel of it. Hope it is not a lost cause. Hi Jeff, thanks for visiting my blog. Sorry to hear about the accident to the watch. The movement in yours is the 8200 automatic which is a reliable ‘workhorse’ that can often be very accurate. The dilemma you’ll have is whether a repair is worth the expense, compared to finding a replacement movement. These aren’t expensive pieces so they an be picked up cheaply, and that may be a more economic route for a ‘donor’ watch than paying for a repair – searching eBay with ‘Citizen 21 jewels’ should find some. 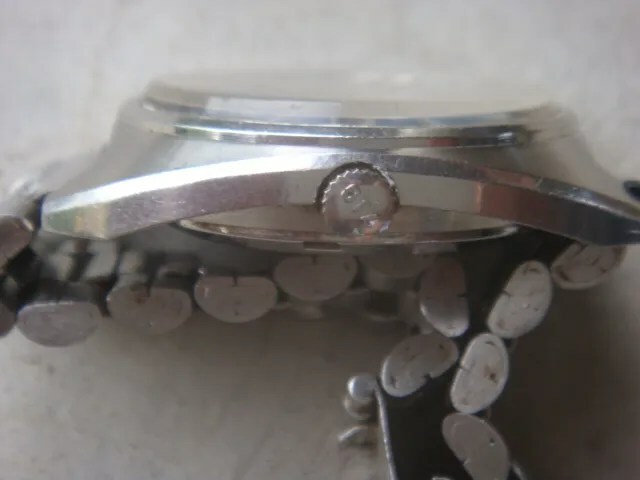 If you have a local watchmaker (not a jewellers) who can take a look and give you a quote for repair or movement transplant (if you aren’t able to do it yourself) then you’ll be in a better position to decide. Thanks, I will start looking for new guts. Good luck with your search and transplant! I have two Citizen date hand wind watches, one with a 2510 movement and the other with a 2510A movement. These movements are of quite a different design to the other hand winders I have seen. Do you have any information about them as when I google “Citizen 2510 movement ” the search produces details for a quartz movement. Are case backs marked in the usual way? i.e. do they have case and model numbers and a serial number? If they have a conventional serial number we can identify the production date. I assume this is a redialed watch but any information you have would be greatly appreciated. The case number on yours – 4-R12683 – and the six figure serial number suggest to me that it is not one of the early models, so I would think it is from February 1988 (from the first two digits of the number – ’82’). ‘GN-4W-S’ is the case type code, indicating a water resistant design with screw on back. Thank you for the quick response. I assumed it was a redial as I purchased the watch from India. The redial doesn’t bother me as I like the watch for what it is. I was hoping it was a little older, just for the cool factor. Any idea as to what the original dial color could have been? I realize there is no way to tell for sure. Hi Derek, I’m afraid I can’t find any images of the original dial for this model, so I can’t help with the colour it was. Thank you for looking. Well, at least I know the watch is a mid to late 80s watch. You’re welcome, it’s a shame no images can be found of an original model. Good morning, Stephen. Glad I stumbled upon your terrific blog. I was about to jump on a couple of great looking vintage Citizens until I realized (thx to you) that they are repainted dials, new or buffed dial windows, and condition-unknown guts. The seller must be buying the old watches by the barrel, in order to re-dial, polish, re-strap, and sell these for 20 USD shipped! Ebay is often “too good to be true”. Great looking watches though! At least by the sales photos that don’t show the case backs. Are they worth it in your opinion, since they are not actually “vintage”? I think new /newer Eagle 7’s can be had for <$100. Thanks, Stephen. I have a couple other questions for another day. Hi Marvin, thanks for visiting my blog and for your kind comment. There are a lot of these re-dialled watches sold out of India. I guess that they are rescuing beat up / worn out watches that would otherwise be scrapped. And as long as you know what you are buying that is fair enough since the asking price is low, and this seller doesn’t hide the fact that they have been re-dialled etc. BUT I also notice that they are described as having 17 jewels, and the 8200 automatic was a 21 jewel model, so this is a bit odd. May be an error by the seller, but it rings an alarm bell, especially since there are no photos of the movement or case back. As a collector and therefore a bit of a purist (or nerd!!) I couldn’t get to like these, but I do understand that if they work, even for a while, $20 is not a bad deal – providing they have the correct movement and you aren’t kidded into buying something you think is original. Blessed morning. I found this on eBay too. Could you see from the photo that this is the original colour? As for the price, I am willing to try it out. Love the design. Hi Bob, thanks for visiting my blog. I’m travelling at the moment so can’t do a full reply. Should be able to comment in a couple of days. Hi Bob – you’re welcome. I’m afraid the 8200 models don’t have any great value, even in original and good condition. This movement was used for over 30 years so there are many on the second hand market, and although a sound and reliable movement they are not ‘high end’ so are not so attractive to collectors and others. Hello i found your website and found it very interesting i really like it, you definitly are a CITIZEN expert ! What can you tell me about this ? there’s a picture of the back with serial etc.. And it is stated in the description also (dial model number too). Hi Jerome, thanks for visiting my blog. I’m afraid I don’t know too much about this watch, other than it has the 8200 automatic movement in it that Citizen used over many years. It is more recent than the time period I know best – the earliest it could be is November 1987, but it could possibly 1997. I would suggest you look for other examples of the same model to check that it appears all correct. or p-8200-r09141-ky , i don’t know which is the relevant one. I would be very thankful , for any informations und an idea for the price i can sell it. I avoid trying to value watches, since so many factors can affect it. It’s probably best to search eBay to find a similar model to get an idea of what it might be worth. Hello, sorry If this is a double post. again love this page and thank you for all that you do!!! Need info on this beautiful piece. Hi Mike – thanks for visiting my blog and for you kind comment. I’m not finding any reference to case numbers 4-638909 or 4-038909 I’m afraid. Can you post a link to a photo? If not can you please describe what’s on the face of the dial, and particularly can you see a dial code, in small print at the very bottom of the dial, usually under the 6 o’clock marker. Assuming this is an 8200 automatic, the serial number – 631235 – is not one of the early ones, which would usually have 8 digits, so it’s likely to be from 1986 or even 1996. The 8200 was produced for over 30 years so dating them can be tricky. 1990s models tend to have a different type of case number though, so 1986 is more likely in my opinion. The case type code will actually be GN-4-W-s, which denotes a water resistant case and crystal with a screw down back. Stephen, Hi thanx for lightning response. how can i upload you or email you pictures? Hi ser!! My uncle gave me a citizen 7eagle 21jewels before he died black face, gold plated i dont have idea if it is oreginal one! !it is 8200-R02092 RC…850999 GN-4w-S! !wish you give me a ideas!! I have a Citizen model 4-281080-KT and noted water on the inside of the crystal after a week or so of receiving it. As with all my autos I shower with it on. I tinker with these watches so I opened it up and noticed no gasket at all. My question is did this model come with a gasket and if so can you direct me to where I can buy a generic replacement. I mention attaining a generic because Citizen tells me that it is non-US watch so they offer no parts or specifications to assist me. Hi Peter, thanks for visiting my blog. Your watch should certainly have a case back gasket. The original part number is 393-0300. I’m afraid I don’t know where to go for a generic replacement, but I would have thought a decent watch guy would be able to find something suitable. The usual advice about vintage watches is not to shower or swim with them even when they have got the gaskets in place. I recently stumbled on a functional citizen watch. The cover had “citizen watch co 4-062019 SMT 80442709 GN-4-S 71-0920 Japan GP. 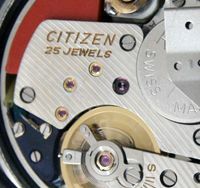 The movement has “citizen watch co 8200A unadjusted twenty-one 21 jewels” written. Please I would like to know if its genuine and date of manufacture if possible. Thanks sweephand. “8200-062008-SM” is all I saw below the 6 o’clock marker. Could it be the dial code? Thanks sweephand. It doesn’t have the ‘eagle 7’ mark. Hi, I am reading your forum with interest and am sat here hoping you can advise me like you have helpfully done to many others. I have in my hand what I think is an 8200 automatic. Here’s some info. It’s 21 Jewel, with a green face with the day in two different languages. I guess that might be English and Japanese? The strap is leather it shows little wear so I’m assuming that’s been replaced. Can you tell me anything useful please? I’m sure you’re right that the strap will be a recent addition – it’s very rare to find original leather these days unless if is a watch that has never been sold or worn. Hi. I’m looking some info about citizen watch. I been looking everywhere and only on your blog I could find some information. Do you think it could be 1993, or even 2003? Any more clues to tell year of mfg on these late model Eagle 7s? Hi Tom, thanks for visiting my blog. It’s difficult to be sure about production dates since the 8200 movement was in production for well over 30 years, and the Eagle 7’s had a long production run too. But there are a couple of stylistic clues to help – first, the 8 figure serial number is more typical of earlier models – later ones were typically six figure, sometimes including a letter. 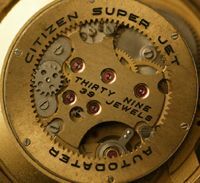 Second, the case number – 4-824008 – is also typical of earlier models, since it includes the ’82’ movement reference. So I’d say this one is from 1983. It LOOKS like an 80s piece, it’s 95%+ condition. Definitely a keeper. These little things get me more excited than a rolex would. Now to find a similiar condition Bull Head, which wont be easy. Thanks! I recently got an Eagle 7 with the following serials at the caseback: 4-R11547 RC 8N0177 GN-4W-S. I’d like to know more about this variant like year released, or anything noteworthy. I’m looking on expanding my Citizen collection especially the Eagle 7s Thanks in advance! Hi Anthony. Other than what you can find here about the 8200 movement, I would add that this model is a later one – this is based on the style of the case number, which contains the letter ‘R’. Earlier models are all numbers. The same applies to the serial number, which also contains a letter and is six digits long. Earlier serial numbers are all numerical and 8 digits long, maybe 7 sometimes. So I would think that this one is from November 1998. Wow thanks for that info Stephen! I never thought this model would be from the late 90’s. Would you know if Eagle 7’s are still in production? I’ve read somewhere that they’re now exclusive in the Asian market and other blogs stated they’re not being produced anymore, new pieces in jewelers and watch retail outlets are possibly the last of the series. Anyway here’s the exact watch I’m talking about, someone wrote about it in their blog: http://jampilihan.blogspot.com/2010/05/citizen-eagle-7-rm180.html. I really love this watch, from its look, size, and of course its heritage. I’m looking forward in acquiring more Eagle 7’s! I want to ask you if you know if this is a redial or not? Thanks for this info! Now I look differant at bying Citizen’s because of your info. I try to look at the 6 o’clock position and then determine if it”s legit and the caseback, I already bought one wich said “Japan Made” at the 6 o’clock. Just starting collecting so these are helpfull thins to look at.Thanks!! Further I like to know how I can send pictures towards you(via email?) about a couple Citizen’s parawater i’ve bougt recently. Two parawaters with waterproof on the front en parawater on the caseback. 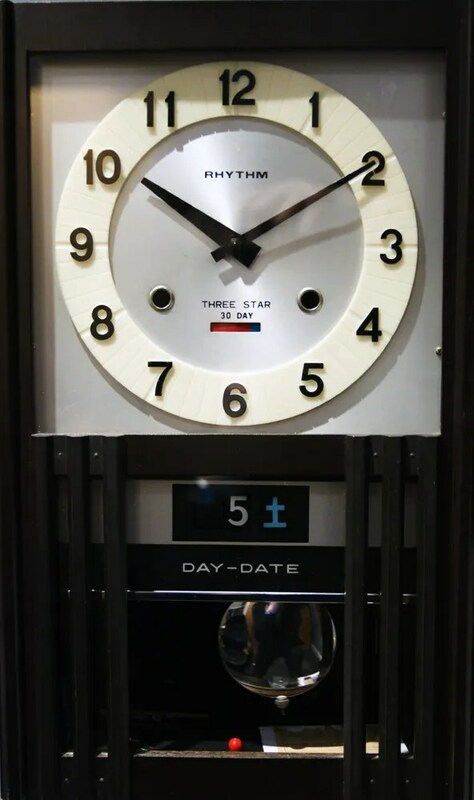 Slin; What to look for are the numbers BELOW the six…the redone dial ones never have that they simply say nothing or Japan made You will find a lot of redials on ebay just take the time to look closely below six and you’ll weed out the redos…Good Luck! Yes, thanks! Sometimes it is hard to see the numbers below 6 o’clock on the internet. Thanks! I will ask but the watches I look for are not that expensive and somethimes I take a chance hoping it will turn out nice;), with this info of your blog I can protect myself even more. Especially the one with the silver dial I’m curious about…love that watch and I even don’t care if it is not real:).I paid E35 for it and I wear it regularly. If I’m not wrong this watch is from March 1970? Wow… I didn’t know that! Homer 1810 movement….beautifull. I will search here on the blog. Tom, where did you find the NOS Eagle 7? I love these old Citizen autos, but the vast majority of what I see on ebay is repainted trash from India. Last year I even bought one from a US dealer, and it was beautiful, until a couple of dial markers fell off! The dealer said she didn’t know (?) it was an Indian refurb. Btw, I’ve picked up a few of the redialed pieces, knowingly, and accordingly paid very little for them. Hola Carlos, gracias por visitar mi blog y disculpas por mi respuesta tardía. Hay muy poca referencia a este modelo en Internet. ¿Tiene alguna foto que pueda mirar? No puedes publicar una foto aquí, pero puedes publicar un enlace si has subido imágenes a un sitio como Photobucket. Si eso no es posible, puedo enviarle un correo electrónico directamente si lo desea. If you happen to get a photo of this watch please also post it on your pages for us to enjoy. Thanks! Gracias Stephen por responder a alguien que te habla desde tan lejos (Chile). Sweep-hand, I have a (silver with black face) Citizen automatic 21 jewels P-8200-S82717-HSK (English/Spanish) marked CITIZEN WATCH CO., WATER RESIST, STAINLESS, 4-039181 HST, 627255, GN-4-S. Could you possibly tell me the age/date of manufacture? Should I assume September 1982? Thanks Stephen. After stumbling upon a variety of references to your website (from others) I’m glad I did. I had thought the ‘S’ and 82 might be the answer from the S82717. Love my old Eagle 7 and, although not mint, wouldn’t trade it’s reliable and dependable automatic function for another. So once again… thanks Stephen and the Sweep-hand team. Hi sweephand, I happened upon this post and wanted to find out a bit more about an Eagle 7 that I have purchased from Etsy a few years ago. 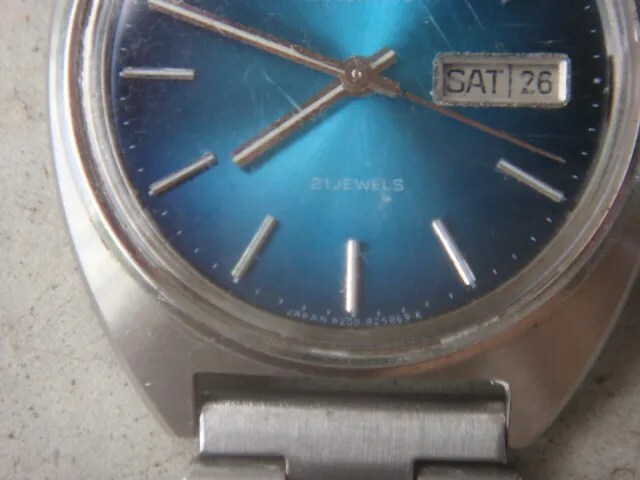 It has a grey dial with a white horizontal stripe across the middle, which on it saids Citizen, automatic, 21 jewel on the left, and the day/ date on the right. Nothing else marked on the dial, assuming that it probably has been refurbished. I just bought citizen automatic diving caliber 8200 model NH8384-14E about 1 month ago. It was very nice looking watch, but I found out that the time movement always keep on moving faster and faster then actual time or the time I’ve set it manually before. Especially when I’m wearing it frequently and everyday. Meaning I wont get an accurate & sharp time compare to quartz engine watch. Even though the seller gave me some tips, to control the time from moving too fast or too slow. For example one of the tips, they advise me to put the watch vertically with the winding crown uppermost to lose second if it is too fast at night when I’m not wearing it. Or to put the watch flat with the dial uppermost TO GAIN a few second if it is too slow. Maybe because lots of movement effect my automatic watch part engine. I’ll take your advise try not to wear it while riding to work everyday so that, not many movement involved. But if the problem too fast still happen than, definitely I’ll need go back to the seller… to do some service, because it was a brand new watch and still under warranty for 2 years. Again… thank you very much, Stephen! Ooohhh… sorry I meant the modern ones or latest Citizen model not vintage, Dr.
What is the production date of this 8200 automatic?. In the Eagle 7 logo there is a blue mark. Why? Hi sweephand , i will be acquiring a 51.2273, with the SN 1080xxx ! I deduce that this is Sept. 1981 ….. am i right 😊 dial is P8200 , water resist , 150 M . This will be my first vintage Citizen, and your blog is a big help ! Thank you ! Many thanks for information and time spent by you! Now I know, year of release of my hours! It is already good! Thank you for the Awsum blog. You are doing such a great job. Hatsoff to you!!! I am a vintage watch collector, i like to know about one of my collection which is Citizen Bull Head Chronograph Watch. I like to know the year/month of the manufacture of the watch and other details. I highly appreciate your valuable inputs on it. Adding with my earlier details i am providing details of my another Citizen Bull Head Chronograph Watch. Much appreciate your comments on it. Thanks for your time on replying it. It is a detailed reply with all the information which I was looking for. Thank you for your blog and your time…. There is a company in India that sells hundreds of used Citizen watches including the 8200 movement. They also sell quite a number of new unused 1970s and 1980s models. I have bought half a dozen of the latter and they work reliably. They have the day of the work in Urdu and English. Not a problem. Hi Sweephand, how are you? I’ve sent you a message here but I think it did not register. Anyway, I have my eye on a vintage Citizen, but I don’t know if it’s in good condition or even if its legit. Looks like it has some corrosion and some scratchs on the inner side. Shouldn’t the jewels have a purple like colour too? Sorry, I don’t much about watchs. Is it correct that this watch was made in April 1981? Thank you so much, Stephen. Your blog is among the best for Citizen aficionados. Hi, thanks for visiting my blog, and for your kind comment. The watch looks ok to me – the 8200 auto’s are often re-dialled, but this looks original. And yes, I agree that it is from April 1981.
wow this very cool because it is exactly my birth month and year. yes redialing issue always make me worried so I always avoid buying from Indian seller on ebay. by the way, Stephen I still got question to ask. How we identify Citizen with 6 digits serial number like this one? The dial resembles to CTY57-1271 but I’m not sure. What do you think? hi, stephen. me again. is this Citizen is from April 1981 or 1991? Because I read that Citizen produced the Cal. 8200 for 30 years. It is Citizen Automatic with number 7 with wings logo. Is it Eagle 7 or what? It is in white dial with fluted bezel like Rolex oyster. My name is Andrey, I’m your follower from Russia. Not long ago I got “new” old Citizen Eagle 7 watch in excellent condition on caliber 8200. I replaced new glass and made full service to the caliber. Please help me to know the year it was produced. I send you also pictures of this watch. There are some numbers on display near “6” o’clock mark: P-8200-R05773-KY.
By the serial number I can guess that it was August of 1983 or August of 1993. 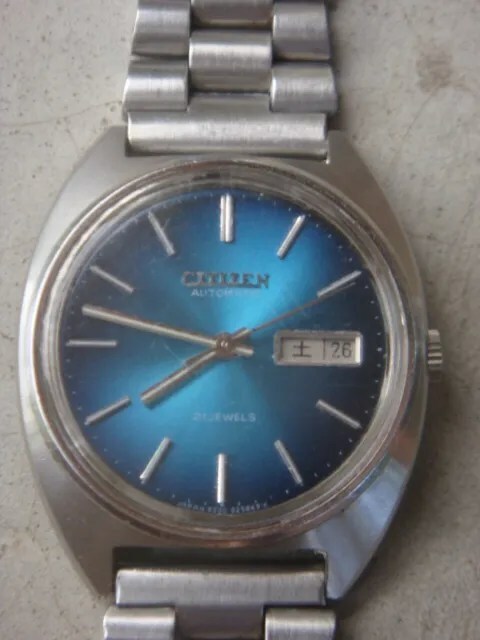 Unfortunately, I couldn’t get any citizen catalogues from 1983 and 1993, but the design of the watch case more similar to 1980-s than to 1990-s. And the inscription “CITIZEN” instead of “CITIZEN WATCH CO” also tells that it is more older watch. I think, it was produced in 1983. Am I right? What do you think? They are original? And – original or not – what’s the year of fabrication? Thank you very much! Thanks again! Your answer is very helpful. I already have a vintage Citizen. I bought it in 2016. I don’t know the name of the model or of the movement, but I can tell you it’s a 25 jewels automatic movement and the watch looks exactly like this one: http://www.ceasuridemana.ro/ceas-citizen-automatic-model-rar_a259505.html (I have photos of my watch, but I must put them on a site and I don’t know how to do it). You can’t open the first photo, if you click on it, so, for seeing all photos you must click on the last one, than use the left arrow to see the rest, including the first one. My watch is identical, except it has blue dial and the days of the week are in Italian. It’s from march 1972. It’s 100% original. It looks and works great. I think it’s a pretty rare model, I saw only a few on internet, and none in this configuration (blue dial, red second hand, days in Italian). 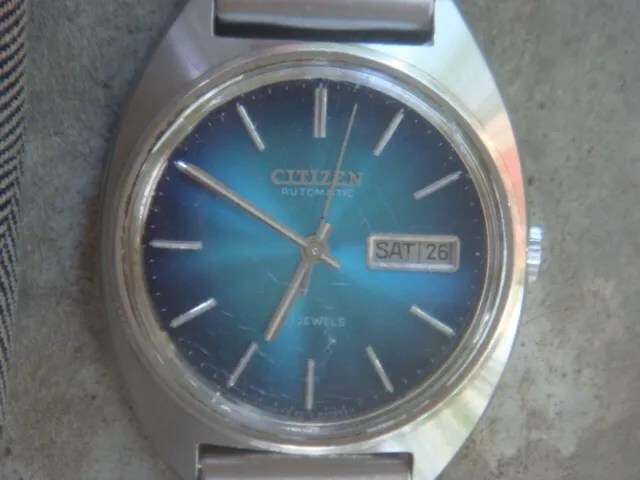 hiya , my name is luke and i recently bought a old 21 jewel automatic citizen but i am not sure anything more than that about it , i was wondering if you could help. Hi and thanks for alot of information about these great watches. I have a question regarding an old clock I bought thats renovated. I set the date for the clock to todays date, and the time. But I wonder how it works so the clock is correct also the next month? I mean, some months have 30, some 31 days? hi Jimmi, hanks for visiting my blog. I have a mechanical (pendulum) wall clock with day and date wheels (I love it!). When it reaches the end of the month it needs adjusting or it will move to 31, 32 etc. So when it needs to be adjusted, the date wheels can be moved on to get to 01. The wheels have a little tab that projects below the casing into the pendulum opening so they can be carefully rotated anti-clockwise until the date is right. Here’s my clock – is yours similar? I have question. could you please help…? I have 8200A, but it’s 17 Jewels. is it true that 8200A is 17 jewels ? I open the case back, the rotor says 8200A 17 JEWELS. Hi, thanks for visiting my blog. Your watch is fine, there is a 17 jewel version of the 8200 auto movement. The 21 jewel version is more common, so it is unusual to see a 17j one. This has reminded me to update the Movement Table which doesn’t refer to the 17 jewel 8200.
hello and thank you for your great article 🙂 I’m a little bit curious about my Citizen watch. I found it in my grandparent’s drawer, in a pristine NOS condition (still in its original box, has an old warranty card, and still has protective plastic on caseback). They bought it in 1981 to gift someone but (gladly) they eventually didn’t. It has 8200 movement and the dial number is : 8200 – 031188 SMS. Vincent, could you please post a pic of your watch? It sounds like a great find! yes Marvin, it is a great find indeed. Sadly it is a bit too old for my age and taste (kinda gold and blingy). So i just store it as my collection. Hey Steph, thanks for the offer. I’ll be glad to provide the pic of my watch 🙂 Message me and i’ll send it via email…. It doesn’t have JAPAN on the dial either. But i forgot to mention it before, it has ‘P’ on dial code, which, if i’m not wrong, is the code of ‘slightly’ radioactive lume (P-8200 – 031188 SMS). i see….so it is probably not made in other Asia’s country (such as Korea / PRC). Thanks for the info Steph. Really appreciate it. i already send it Steph, sorry for the wait! Is it legit? Thanks in advance! I forgot to take photos of the front, it was a silver model. Quick update, I’ve acquired the watch and took some more photos of the dial and back. Thanks a lot for all your help Stephen, stumbled across your website by chance and found a great deal of info. Kuddos to you! Thanks for all your help Stephen! Is this an original automatic 8200 movement? And is there any additional info you can tell me about it? I recently found a citizen watch from my grandfather house. need your help to get info of the same. at the back of the watch: CITIZEN WATCH CO. 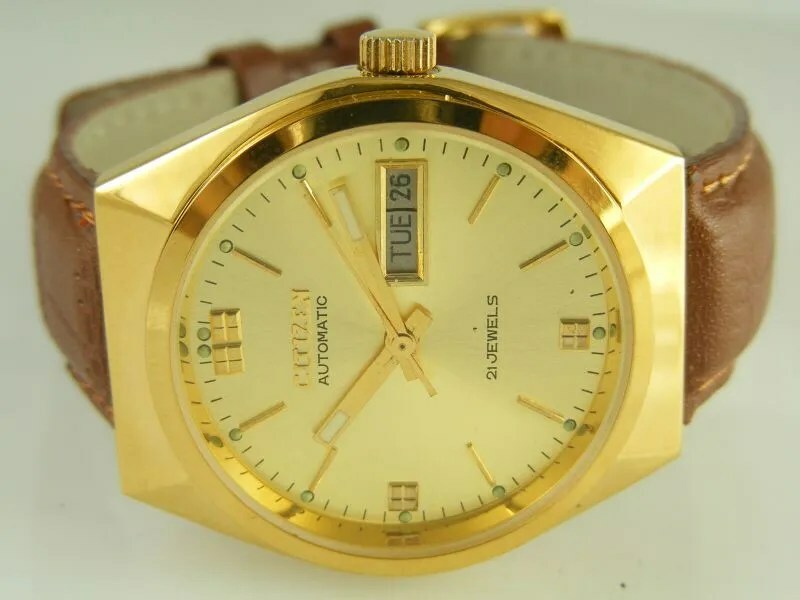 I hope to get more information, about the year of manufacture and the prize, he is also gold plated with good condition, it has scratches, you see them if you are really to the close to the watch, sorry don’t know how to upload pictures here. I bought a Citizen old Eagle 7 on Taobao.com(a China online store, like eBay). Some trader(I guess they are old watch recyclers) sell lots of Citizen 8200/6651a/6601/6t51, seiko 7009/6309/7s26, orient 46941/46943 and little some Switzerland Movement etc, Most of them Movement don’t work and no back no watchband, they sell them as “Replacement” or training. Citizen 8200 Movement sold randomly about 9.2 USD, but I talk with the seller, use about 12 USD buy this one still work old Eagle 7. I hope to get some information, Production Date and I am not sure it is true or fake. Seller gift me a Citizen watchband, I am not sure if it is original with other Citizen 8200 Movement. I already buy tool and try to open it, but I failed, also in the watch fix store they can’t open it, unless destroyed back, but it works fine, I don’t want to do this. I hope to get your reply, Thank you! btw, someone say the 8200 early model with metal date and week, green ink on movement, after that model with plastic date and week, steel stamp on movement. I also think my Citizen(plastic date and week) from 80s or 90s. This was before the 8200 became the workhorse auto for Citizen, and no doubt cost savings would have been introduced, for example using plastic instead of metal for certain parts. I’m afraid I’m not seeing any pics via your links. I opened it today, the movement look like original? I thought it was rusted before, but not, just O-ring ageing. I use tape to cover logo, use stainless steel ruler and Epoxy glue the back, easier to open. Clear it need Acetone, but i don’t have, so more difficult cleaning. Yes, I will be careful. Thanks for your help! Hi Brian, thanks for visiting my blog. The method is to use the first three letters of the serial number (‘102’) to determine year first, then the month. So this is from February (02) of ….. a year ending in 1! The decade of production is needed to get the year, which is usually relatively straightforward, but the 8200 was made for over 30 years. It was first sold in 1975 or 76 so it can’t be earlier than that. The 8 digit numeric serial number suggests that it is a earlier model – later ones often have 6 digits, and may include a letter too. So I would think this one is from 1981. Thanks for all the great information here. I’m assuming it’s from March 1976 or March 1986 but would appreciate your help. I also have a Citizen 67-9119 Chronograph from August 1980 that I absolutely love. Could you help me figure this watch out completely.